The 2/10 Mighty WurliTzer Style 216 Console. This organ was used as the template for Jim Henry's Mighty MidiTzer. This very rare Theatre Pipe Organ is like the one used to model the Mighty MidiTzer. 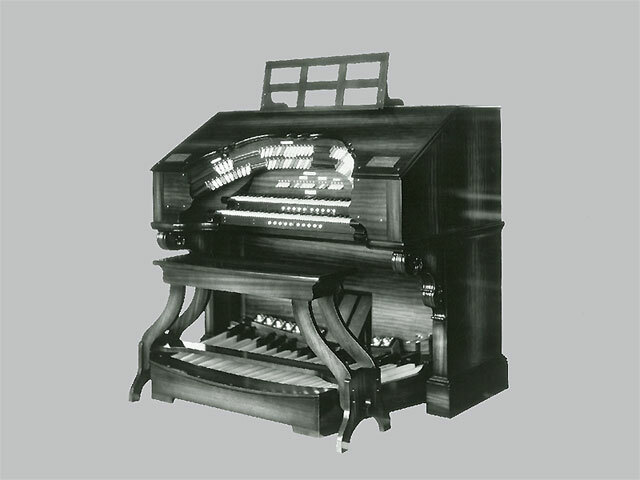 There were only twelve of these wonderful little organs ever built by the Rudolph WurliTzer Company in Tanawanda, New York during the early 1920's. San Bernardino 2/10 Mighty WurliTzer Style 216 Console stop sweep. Photos by Paul Kealy - Panorama by Fred Willis. The panoramic image above is the result of taking three pictures, supplied by Paul Kealy, and turning Walnut Hill's Founding Father Fred Willis loose in Adobe Photoshop, where he spliced them together quite well. You can read the names of the stops 'round the horseshoe in the larger downloadable image. 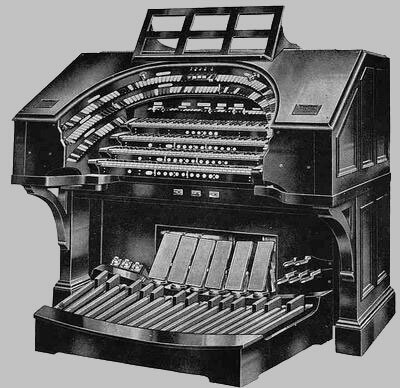 The Style 216 Mighty WurliTzer had ten ranks of pipes in two chambers, with traps and tuned percussions on the toy counter. Joe Barron has a complete specification of the Style 216 at his VirtualOrgan.com website on the Style 216 Spec page. Look closely at this console. Note that it looks like the huge Empire four-manual instrument pictured below, having no scrollwork on the lid. It has the same styling and trimwork right down to the corbels on the pedestal. Could the Style 216 be perhaps the little brother of the J. Tyson Forker Memorial 4/32 Mighty WurliTzer? Four manual WurliTzer Empire style console. There were many three-manual WurliTzers built during this time using this same motif, some with single row bolsters and others with double row bolsters like the one pictured below. However, the Style 216 stands alone as "The Little TPO That Could." Three manual WurliTzer Empire style console. Do not underestimate this very fine instrument. It had all the tonal flavors needed to play most TPO music. The ten ranks of pipes covered all the tonal families that made up a good organ. The traps and tuned percussions made silent movie accompaniment a joy. To hear this for yourself, concider purchasing the album pictured below by George Wright entitled Live At The Rialto. These exciting recordings were made during George's famous concert series at the Rialto Theatre in South Pasadena, California. Here are two hours of "The Living Legend" playing some of your favorite music, both in front of a live audience, and in special after hours recording sessions. Featuring: Valencia, One Fine Day, Mister Sandman, When You're Away, Neath the Southern Moon, Rose of the World, Streets of New York, Touch of Your Hand, Take the A Train, I'm in the Mood for Love, Jazz Me Blues, I Don't know How to Love Him, King Herod's Song, Serenade For A Wealthy Widow, Selections from Rose Marie, Night Ride, Way Down Yonder In New Orleans, How Insensitive, She's Funny That Way, Selections from Hit the Deck, If I Could Be With You, Jupiter from the Planets, Mediatation, O'l Man River, Underneath the Stars, Samba Maxixe, Buffoon, I'm a Dreamer, Ritual Fire Dance, Norwegian Wood, Girl with the Flaxen Hair, Petite Fleur, Flying Fingers, and Liebestraume. The Style 216 was concidered to be the "Hot Rod" of two-manual WurliTzers. It had nearly 70 stop tabs, two swell shoes, a crescendo pedal, and a host of thumb pistons and toe studs. It also had a versatile moving stop combination action with two piano pedals for Sfrazondo and Sostenuto. Yes, these organs were very powerful beyond their size, indeed. 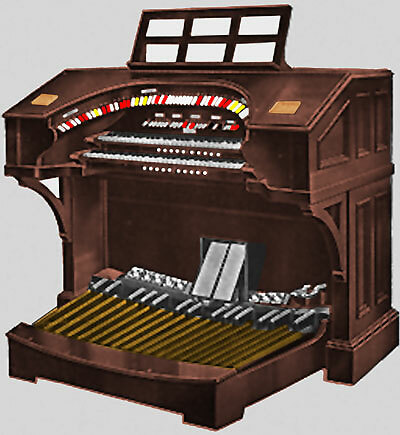 Sadly, there are no WurliTzer Style 216 instruments currently left in playable condition today. Fortunately, there is one that is being lovingly restored by Jim Henry and friends, the San Bernardino 2/10 Style 216 Mighty WurliTzer featured here at Walnut Hill during the month of August, 2006. Also of note, the organ pictured below, another Style 216 Mighty WurliTzer made famous by the legendary George Wright, and formerly belonging to Bob Loech, is being reinstalled in the Rialto Theatre in South Pasadena, California. This is the original home of this fine little organ. Stay tuned as the story unfolds. 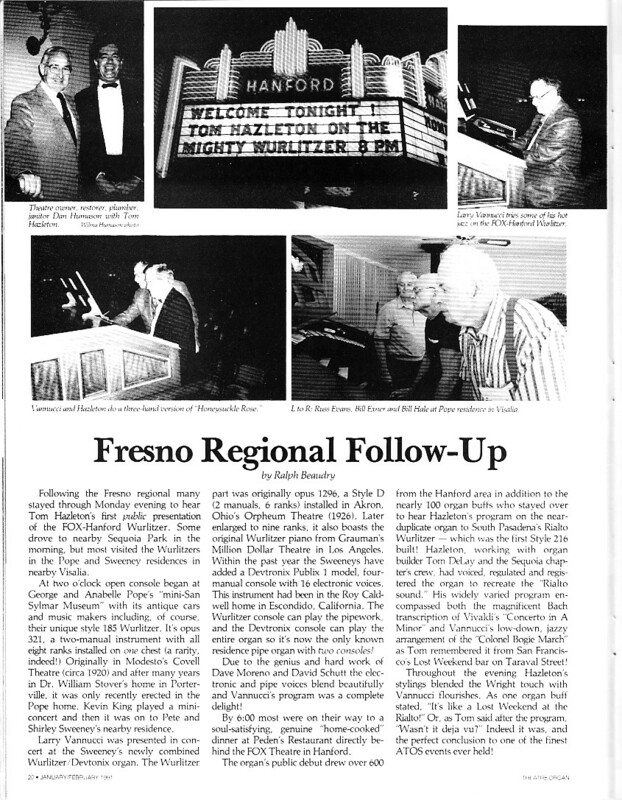 Rialto WurliTzer 216 newsgroup on Yahoo! 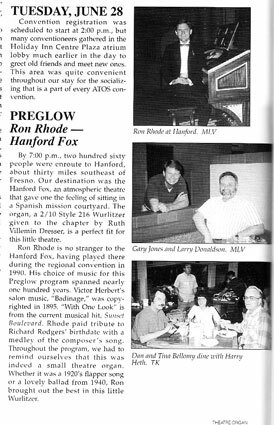 The Rialto WurliTzer 216 newsgroup on Yahoo! There is a group on Yahoo! 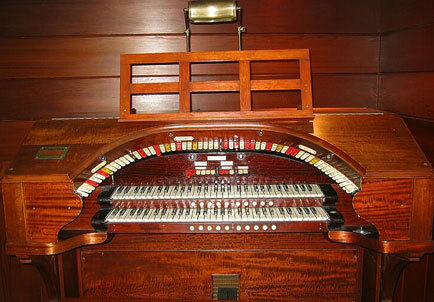 created by Russ Ashworth, fellow Walnut Hill VTPO member, dedicated to this fine organ called Rialto WurliTzer 216. We strongly urge you to join this group and take part in the restoration of this fine instrument. Jim Henry's Mighty MidiTzer Style 216 Virtyal Theatre Organ program for Windows puts this powerful machine virtually in your hands. All you need to get started is a computer. Dive right in there and get aquainted with it and all the neat things it can do. Then, add MIDI keyboards and pedals. Before long, your world will be filled with the glorious sound that only a Mighty WurliTzer Style 216 Theatre Pipe Organ can make! Here are the three applicable selections from the 1994 Nov/Dec ATOS Journal from the review article about the Fresno ATOS convention that previous Summer about the Hanford 2/10 Style 216 Mighty WurliTzer Theatre Pipe Organ. The page names are dated. Click each one to download a full-size image. 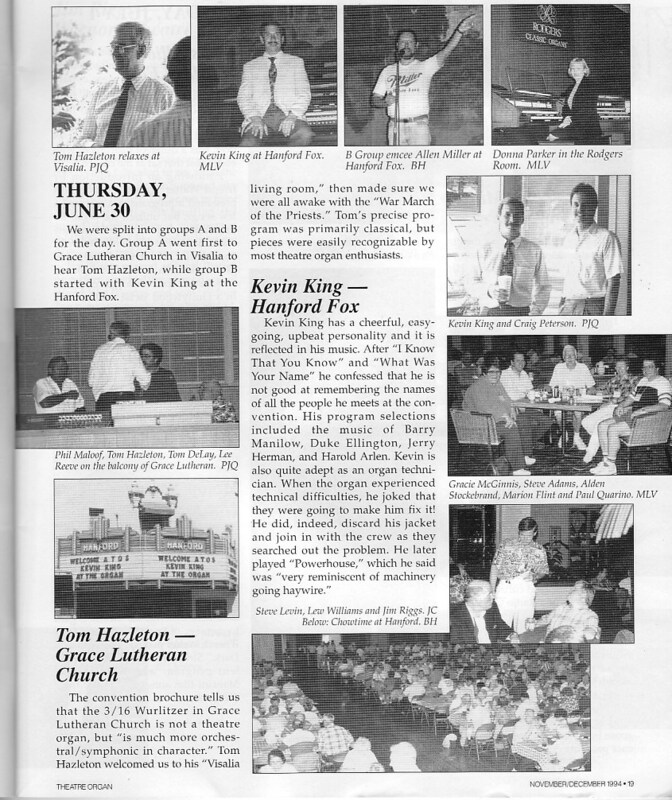 The first page is from 6/28/1994. The second page is from 6/30/1994. The third page is from 7/1/1994. 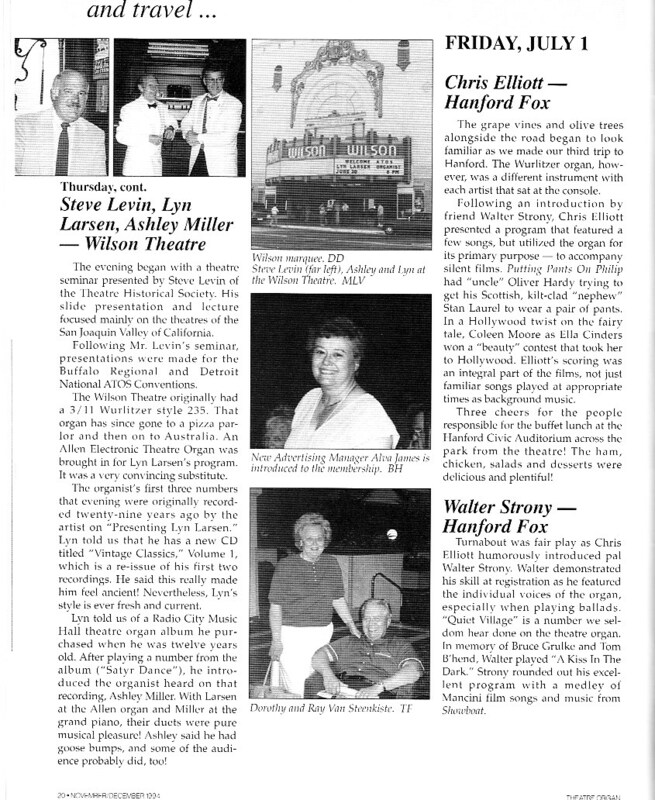 These were the days the Hanford Style 216 Mighty WurliTzer was used. Here is a filal page from the 1991 Jan/Feb ATOS Journal, with the several photos taken in Hanford and a bit of a write-up about Tom Hazelton's program there. The organ has 10 ranks but it is not exactly a Style 216, which has a Viol Celeste instead a Kinura. 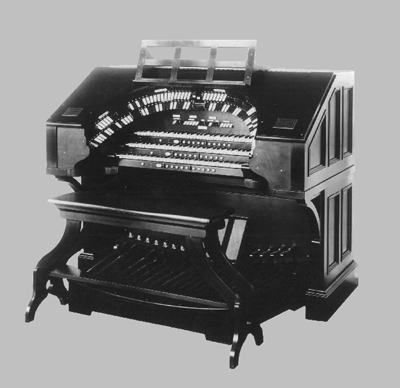 The Style 216 seems to be unique among several versions of 10 rank WurliTzer instrument in that it also had the English Horn. According to Jim Henry, the creator of the Mighty MidiTzer, the WurliTzer being installed in the South Pasadena High School and featured during the 51st Annual ATOS COnvention about a half mile from the South Pasadena Rialto, will have 10 ranks of pipes playing and then another 6 digital ranks will be added later. At the 2005 Annual ATOS Convention, only the pipes were playing. They are the same 10 ranks as a Style 216 except that they do not have a Viol d'Orchestre Celeste and they do have a Kinura. So if you ever wondered what a Style 216 Mighty WurliTzer would sound like with Tom Hazelton at the console, you chance to find out was during the Convention. A scroll-top 2 manual WurliTzer console. As you can see, the Style H also had the Viol Celeste but did not have an English Horn. So which might sound "better"? Probably neither. They just appealed to differing tastes, maybe. Post Horns make an organ exciting to listen to, and they complete the tonal spectrum of the instrument, which is the sound we are used to today. Back in the days of the 1920's, the Post Horn was not added on many organs except for the larger specifications, the Style 216 being an exception. The lead rank was either a Tuba or a Trunpet as with the style H and its counter parts. Even the 4 manual 20 rank Pubix had a Tuba for its loudest rank. The sounds were more sweet and mellow, and leaned towards the sounds of the day with the romantic organs found in churches and concert halls. 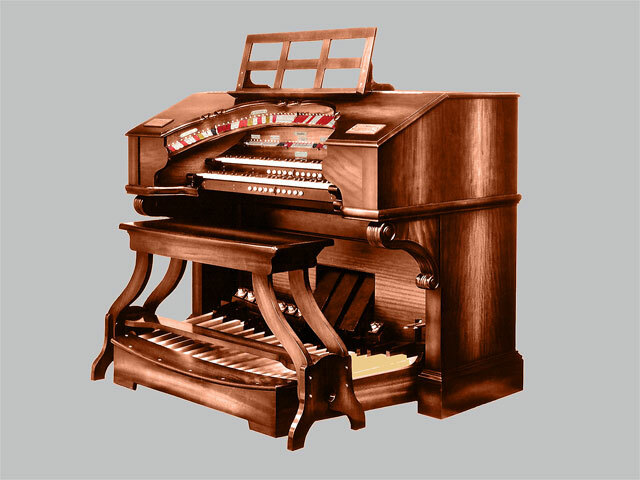 Even modern classical organs have changed. Going for more fiery reeds and bright mixtures, they make the romantic style organ sound tubby in comparison. The Style 216 specification is a more exciting one than its tamer counterpsrts, and perhaps it started a trend in the 50's and 60's to spur rebuilders of these organs to add Post Horns onto the respecifications. A lot of pipe builders have offered the Post Horn in later years. Trivo and Moeller come to mind. The keydesk of a 2 manual 8 rank WurliTzer console. Moeller Post Horns were voiced in the early seventies by the same man who worked for WurliTzer as their reed voicer. The Post Horns from Moeller at this time were prized posessions and had a great sound. They were added to many rebuilds. Also, this was the start of the heydays of the organ equipped pizza parlors and these ranks really were important to those organs. Also, like the Style 216, many of these were moved about. Styles 205, 215, 216, 220, G, H, H3M, HNP, R15, and the R16. A double bolster scroll-top 2 manual WurliTzer console. At least this is the information known by the ATOS.